Big old black oaks on Sonoma Ridge Trail at Jack London State Park. They were bare in March when I took this photo, but should have colorful orange leaves this month. Almost 11 miles out and back through woods and a bit of grassland on Sonoma Mountain. Autumn in wine county is enchanting! Enjoy crisp weather and admire colorful foliage on bigleaf maples, black oaks, and grape vines. This hike is lovely in late winter and early spring. On October 6th the park will be hosting a celebration honoring Jack's Oak -- you might choose that day for a visit or not, depending on your tolerance for crowds. Jack London State Park is hike 4 in 60 Hikes in 60 Miles: San Francisco (third edition). Read about this hike on BAHiker. Los Trancos Open Space Preserve. 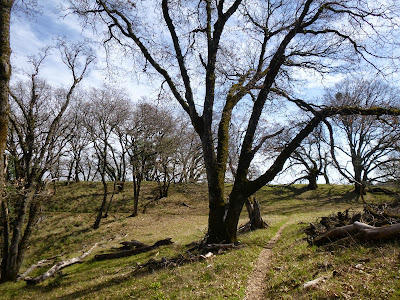 Enjoy an easy, mostly shaded 3 mile loop through this Santa Cruz Mountains preserve. Grab a brochure at the trailhead to follow the interpretive earthquake tour.